1. Confirm the your school has your mobile number in the Parent Information System. 2. Text “Y” or "YES" to 67587 from each wireless device they wish to receive texts on. 1. Don’t opt-in and don’t reply to the opt-in invitation message. 2. Text “STOP” to 67587 at any time. 4. Request that we add your number to the account’s phone number block list. Can the text messages come from a district phone number, instead of the shortcode? No. Shortcodes are the industry standard, and the only fast and reliable way to deliver mass text notifications. I received a text message that says it’s from SchoolMessenger? What does that mean? 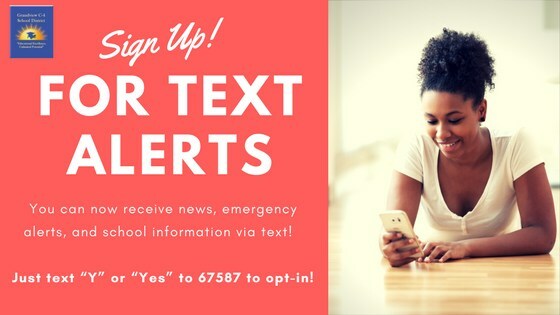 If it was from 67587, that was most likely the Opt-In Invitation message sent School Messenger, our district's notification system. Ensure that the district has your correct device number in the database (Student Information System or HR System), and that it is located in the SMS phone field(s) that are synchronized with Communicate. It may take 24 hours for a number to become active after being changed or added to the district’s system. Confirm that the district has actually attempted to send a Communicate broadcast which includes an SMS text message to your mobile phone number. Opt-out Response: You’re unsubscribed from SchoolMessenger. No more msgs will be sent. Reply Y to re-subscribe, HELP for help. These replies DO NOT indicate that the wireless provider cannot receive a message from us. Rather, they are an indication that the specific mobile device does not have shortcode SMS texting for that number (this is sometimes disabled by default on company provided cell phones). To address this, contact your wireless provider. Note: Providers sometimes use various names for this type of texting service (e.g. shortcode, SMS, premium, etc.). If you simply ask about text messaging, your carrier may assume you are referring to person-to-person. Therefore, be very clear to refer to “short code” text messages. Most TV programs that have a voting component use shortcode SMS messaging (e.g. American Idol, Dancing with the Stars). In addition, many department or grocery stores use SMS to distribute coupons and deals. Using an example such as this can be helpful in clarifying the type of texting service you want to enable. Will I be charged for the text messages that I receive from the district? Our School Messenger system does not charge recipients for the text messages that they receive or send to the shortcode; however, wireless providers may charge for individual text messages, depending on the plan associated with the wireless device. Please consult your carrier if you are uncertain.